We have had some users that are running Apple’s new operating system Mavericks experience some issues with projection. If you are running Mavericks and have an issue it may be your display resolution and refresh rate is set to high for the projector in the room you are in. 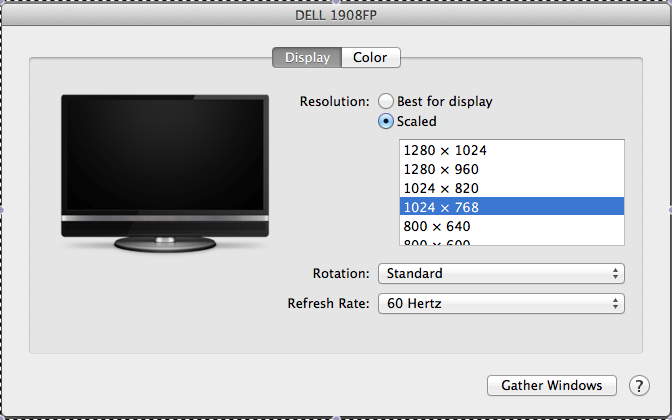 The default seems to be 1440×900 with a refresh rate of 90 Hz and if that works for you great! 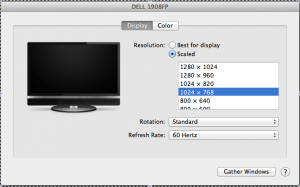 If not try changing your resolution to 1024×768 with a refresh rate of 60Hz and that should work in all of our rooms. Hope this helps and happy projecting. This entry was posted in Midd Blogosphere and tagged For Faculty, For Staff on February 21, 2014 by David Wright.